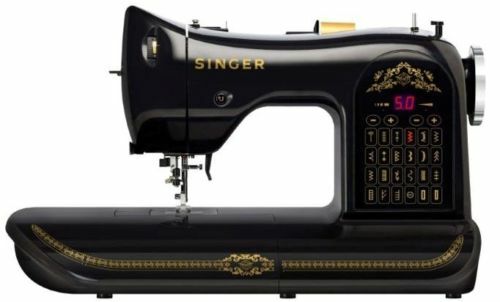 I was browsing a really cool blog a lil while ago, Alice's Closet, and she had posted about Singer 160th Anniversary LIMITED EDITION Sewing Machine. When I saw this picture, I literally STOPPED BREATHING. My brain had shut down. I dont think I ever reacted this way towards machinery before. I fell in LOVE..just like that. If you share a passion for sewing and love the antique Singer sewing machines, you are gonna love this. A modern machine with an Ol' School twist. Designed similar to the Black and Gold Singer Machines like back in the early 1900s, this baby is computerized and digital and even threads itself!!!! Then you can enter for a giveaway that SINGER is having in honor of their 160th Anniversary! All you have to do is share Singer Story for a chance to win this awesome machine! I already shared my story! Here it is below to share with all of you! "My great grandmother and I share the same name Cecilia. What I later found out is that we shared the same passion for sewing. Although I never met her I always felt a strong connection to her. I was told she had her own boutique in Brooklyn in the early thirties/fourties and that she made patterns out of newspapers. I was always intrigued by that. I dont remember who taught me to sew, I just know that I always knew how. I would watch my grandmother and my mother sew- of course all with a Singer Machine. When I was pregnant with my children, I would sit for hours in front of my machine creating baby blankets and fixing my jeans to fit my growing belly. When I served in the army, I used my singer to sew patches on my uniforms and that of my fellow soldiers. Now, I am the only one in my family that sews. My 8 year old daughter, Arabella asked me to teach her to sew and I am so excited to carry on the tradition. My son Matthias even wants to make something! I didnt sew for almost 4 years until very recently, and the second I started, I broke down in tears because it reminded me of my grandmother who passed 2 years ago. Her and I had such a bond and sewing time was another was we were close. I hope to live on for my great grandmother and my grandmother. I feel that sewing is in my blood and I hope that it continues to thrive in my family even after I am gone. That is my story! Thanks for letting me share!" Now that you read my SINGER STORY, GO SEND YOURS IN! GOOD LUCK my fellow Singer Seamstresses! "All my scattering moments are taken up with my needle. ~Ellen Birdseye Wheaton, 1851"